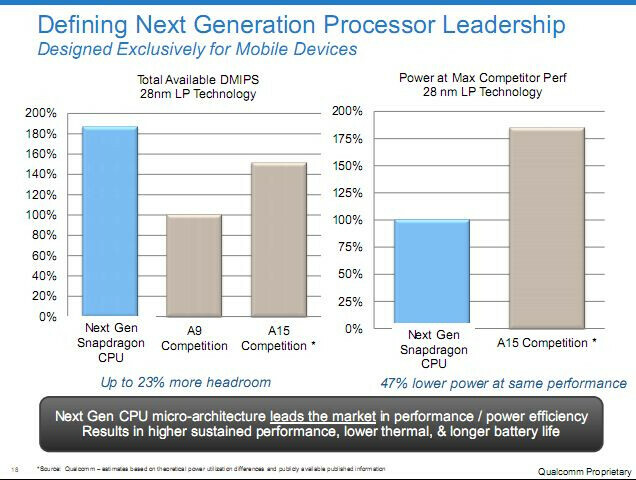 A leaked presentation of Qualcomm's next generation Snapdragon chips reveals plenty to be looking forward to. Based on the future Krait architecture, the MSM8270, MSM8930, MSM8960, and APQ8064 are expected to be as much as five times faster than current CPU chips. When it comes to graphics power, they are said to be 4 times faster which provides the user with 'console quality gaming'. A chip made out of a a 28 nanometer process would have 23% more computing power and use 47% less battery power than an Cortex A-15 running at the same speed. 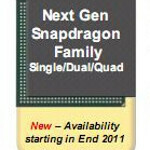 Similar to the A-15, these Snapdragon chips could run at 2.5GHz and will be offered in single-core to quad-core models. Qualcomm will be sending out the MSM8960 with 3G and 4G LTE cellular capabilities by the end of spring with the remaining chips getting tested by the end of this year. 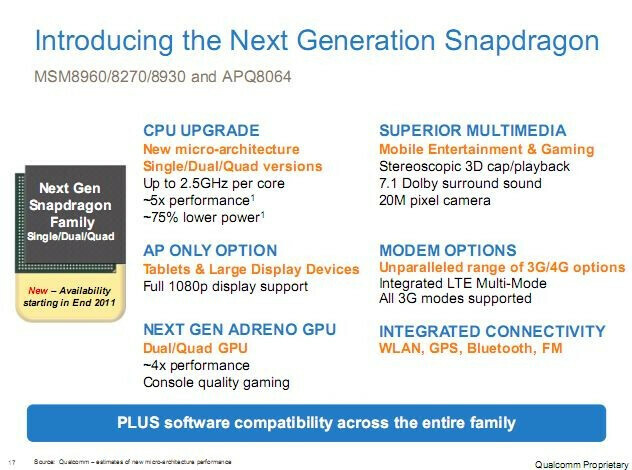 But don't expect to see this new generation of Snapdragon chips in a handset until sometime next year. As you can see below, this new generation of Snapdragon will be capable of running 1080p displays and 3D video, 7.1 Dolby SurroundSound and a 20MP camera. With technology like this, the future can't get here fast enough. Wait till windows 8-9 phones get these. Why play xbox 360 games on your tv when you can play them on your windows phone. Hopefully they will have emulators for ps3 and xbox for android. why would anyone want to play a game like cod on a small 4.x inch screen? are you serious? Because, Belovedson, you can hook up your phone to a TV and use the phone as the console. Or even have a phone with a pico projector once smaller die/nanometer procesess, better screen performance, and multi core chips start extending battery life significantly. I'm guessing that MS has plans for the kinect interface on phones as the next level of interaction and control versus keyboard / keypad / touchscreens so that would solve the lack of controlers issue. Convergence with phone = a portable console; = MS can stop selling hardware at a loss; = MS can streamline offerings and increase synergies in software for different platforms. I bet teh Windows Phone chassis specification roadmap has front facing camera and eventually infrared sensors to accomodate kinect software. MS will own the world once again as they slowly but surely leverage thier way into the mobile devise which will be teh personal computing device of the future. @belovedson you serious? why the hell wouldn't you? Some things are fail to understand, but with all this computing power built into these chips are any of these OS's capable of using the chips to maximum capacity and not drain the battery dry in less that 5 hours? All this cool tech but nary a developer has time to take advantage of it, things move too quickly before anyone can capitalize on the architecture. Look at the power savings the new Snaps have, but i guarantee that if they are in HTC phones they will eat batteries for breakfast, lunch and dinner. in fact I have to yet see any new smart phone that really can utilize the processor enough not to drain the battery dry. Always a better this and that, but nothing seems to be getting better battery life.